Last year, Intel leaders announced the six technology pillars that underpin all our products: process, architecture, memory, interconnect, security and software. Last week, we launched an amazing array of new data-centric products, featuring new processors, memory, network controller, SSDs, FPGAs and more. Both events were built around our vision of data for this new era – move faster, store more and process everything. This week, along with a team of Intel’s technical leaders, I provided an update focused on “move faster,” detailing the vital role interconnect technology plays throughout Intel’s entire portfolio. Intel’s investments in interconnect technology are among the broadest in the industry. Our technology moves data within a chip, to package, to processor node, through the data center, to the edge, via long-distance wired or wireless networks, and back to the core. Intel is uniquely positioned as a pioneer and leader in all these interconnects that span microns to miles. Interconnect technologies provide the ability to connect and transfer data that is growing at an exponential rate. It is estimated that only 2% of the world’s data has been analyzed, leaving a great untapped opportunity to propel business and to fuel societal insights. Interconnect technology is the literal link between the raw data and the compute engines that can extract value from it. Rapidly growing data drives an insatiable need to scale computing, storage and interconnects, in concert. Put simply, we can create the fastest processing cores, smartest field programmable gate arrays (FPGAs) or the highest-capacity solid-state drives (SSDs), but without high-performance interconnect technology to allow data to flow quickly and efficiently, the performance of the whole system or service will never reach its potential. How data flows across the entire spectrum between microns and miles informs our future architecture direction for each of the interconnect elements, as well as the computing, memory and I/O elements that reside on either end of the connection. It takes a holistic approach to sustain high rates of efficient data flow from chip to edge. Intel’s participation in many interconnect market segments and leadership in industry standards, such as USB and the new Compute Express Link (CXL), stimulates the entire ecosystem to innovate faster and advance the state of the art. The creativity of the whole market is unleashed to deliver higher-performance systems and better digital services for everyone. 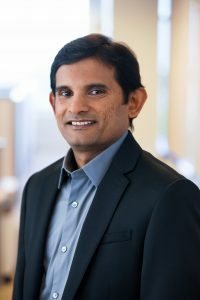 Sailesh Kottapalli is a senior fellow and chief architect of data center process architecture at Intel Corporation.